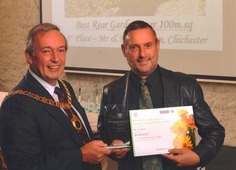 ​Chris Casburn accepts first prize for large back garden in the Residents & Business Garden Competion run by Chichester District Council. He was also placed first in the small back garden catergory. Thanks again for the 3D design. It was very useful to make the changes to our garden we had talked about for so long. The planting guide was useful and we've added to it. We had an old fountain that was in bits at the back of the house. Best Garden Design made this a central feature of our new garden, planted with alpine plants sourced from a local garden centre. It looks the business! The 3D design produced by Best Garden Design was a great starting point to construct this minimalist garden with reflective pond and the innovative used of meadowmat. The client, myself and the garden designer discussed changes as we progressed with the build, so that the final result exactly met the clients needs. I look forward to working with Best Graden Design in the future. I LOVED the drawings. Every idea just brought exactly what I wanted to life - perfect! I have already spoken to my architect so that he incorporates the design into his thinking for the extension. Your input and 3D designs have been fantastic and offered a lot of food for thought. You provided us with a great deal of advice and a chance to "think outside the box".